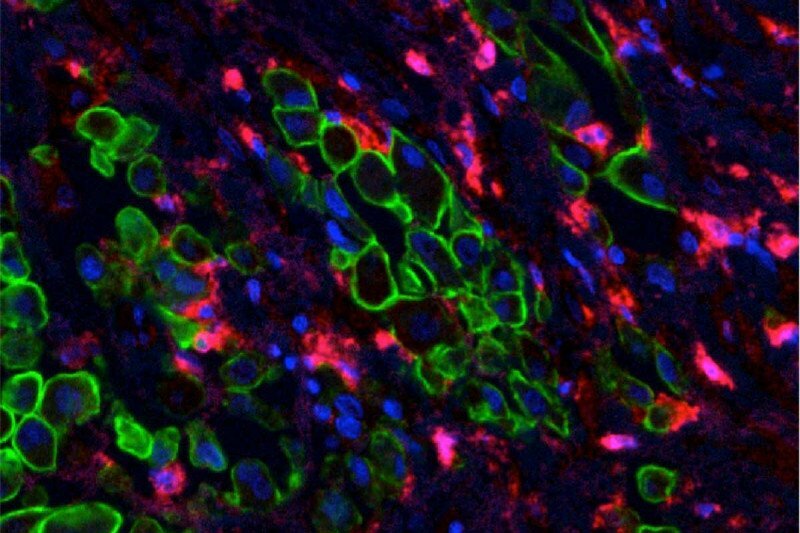 Immunofluorescence staining of human mesothelioma showing tumor cells (green) and T cells (red). Scientists at Memorial Sloan Kettering are investigating ways to develop effective CAR T cell therapies for solid tumors. Results from a clinical trial in people with mesothelioma indicate that an experimental CAR therapy is safe and may provide benefit to patients, especially in combination with other immunotherapies. Chimeric antigen receptor (CAR) T cell therapy has shown great promise for the treatment of certain blood cancers, like leukemia and lymphoma. By contrast, using this method to treat solid tumors has been more challenging. On March 31, 2019, Memorial Sloan Kettering researchers presented results from a phase I clinical trial of CAR therapy in mesothelioma. This hard-to-treat cancer usually affects the tissue surrounding the lungs, called the pleura. According to Prasad Adusumilli, a physician-scientist at MSK who is leading the trial, the CAR therapy proved safe and showed signs of efficacy in a small number of patients. Dr. Adusumilli presented these results at the annual meeting of the American Association for Cancer Research, held this year in Atlanta. The study was featured in the meeting’s press program. This trial included 21 patients: 19 with pleural mesothelioma, one with metastatic lung cancer, and one with metastatic breast cancer. They received CAR T cells built to target a molecule called mesothelin found on the surface of the cancer cells. The CAR T cells were infused directly into the space between the pleura. A few weeks after the CAR T infusion, 14 patients received another immunotherapy treatment called pembrolizumab (Keytruda®). This drug, a type of checkpoint inhibitor, blocks a molecule on immune cells called PD-1 and boosts immune responses. Dr. Adusumilli and colleagues had previously shown that this combination was effective in treating cancer in mice. Two patients who received PD-1-blocking drug had a complete response, as measured on PET scans, at 38 and 60 weeks after treatment. Five patients had a partial response, and four had stable disease. Patients tolerated the CAR T treatment well. There were no CAR T–related side effects. Severe cytokine release syndrome, which is characterized by dangerously high fevers and has complicated CAR therapy for other cancers, did not occur in any of the patients. “The combination of CAR T cell plus checkpoint blockade has been long awaited,” says Michel Sadelain, one of the pioneers of CAR T therapy. “This is the first study to support its possible efficacy in solid tumors.” The study represents 10 years of effort at MSK to develop a CAR therapy for solid tumors, he adds. MSK scientists developed the first effective CAR T cells for cancer. These prototype cells are built with an activity-boosting molecule called CD28 and target a molecule on B-cell leukemia and lymphoma called CD19. This cell-surface molecule is a good target for CARs because it is found on all B-cell cancers but not on other tissues that are critical for life. Mesothelin is a potentially good target for CARs because it is present abundantly on solid tumor cancer cells but minimally on normal tissues. In addition to mesothelioma, mesothelin is found on pancreatic cancer, triple-negative breast cancer, lung cancer, and others. Drs. Adusumilli and Sadelain designed the mesothelin-specific CARs used in this study. The CAR T cells used in this study were engineered in MSK’s cell manufacturing facility, led by Isabelle Rivière. Editor’s note: An earlier version of this article was published on May 17, 2018. It was updated with new information on March 31, 2019. Dr. Adusumilli’s research is supported by the National Cancer Institute, the Department of Defense, a Stand Up To Cancer (SU2C)-Cancer Research Institute Cancer Immunology Dream Team grant (the AACR is the Scientific Partner of SU2C), Baker Street Foundation, Mesothelioma Applied Research Foundation, Trumbull Foundation, and Dalle Pezze Foundation. MSK has licensed mesothelin CARs to Atara Biotherapeutics. MSK has received license fees and has the potential to receive royalties under the license. Adusumilli and Sadelain are inventors and will receive a share of the license income. Adusumilli’s and Sadelain’s labs receive sponsored research funding from Atara Biotherapeutics. Hello, I am curious to know if mesothelin is found in other hormone negative breast cancers? Does being Her2 positive preclude the presence of mesothelin? Dear Fraser, according to Dr. Adusumilli, mesothelin can be found in both HER2-positive and HER2-negative tumors. It is only found in a proportion of patients for both types, and a higher percentage of HER2-negative patients have it. The only way doctors can determine mesothelin status in a given patient is by testing the tumor. For HER2-positive patients, the CAR T cell trial is not available because there are better therapy options. Thank you for your comment. Is this trial an option for metastatic lung cancer adenocarcinoma L858R del. 19, EGFR pos. resistant to Tarceva/Tagrisso after 2.5 yrs.? If not are there any plans for additional CAR T cell trials in the near future for these patients? MSK has a number of trials for metastatic lung cancer. If you would like to make an appointment to learn more, you can call 800-525-2225 or go to https://www.mskcc.org/experience/become-patient/appointment for more information. Thank you for your comment and best wishes to you. Researchers at MSK and other centers are studying how to use CAR T cells to treat many solid tumors, including prostate cancer, but there are no approved treatments at this time for prostate cancer. Thank you for your comment. Dear Yasmin, we’re sorry to hear about your diagnosis. There are no FDA-approved CAR T treatments for breast cancer, but MSK does have a clinical trial for certain subtypes of metastatic breast cancer. If you are interested in learning more, or finding out about what other treatments MSK has available, you can make an appointment online or call 800-525-2225. Thank you for your comment and best wishes to you.